The Weiser Law Firm, LLC, is experienced in the preparation and execution of Wills and the Administration of Estates – Successions. Call 504-358-2273 for Help from a New Orleans Will Writing Lawyer today. 10. Numerous other factors that will present themselves after your death. The process of drafting a will is complex and there are continuing changes to the law that you want to make sure you take advantage of. 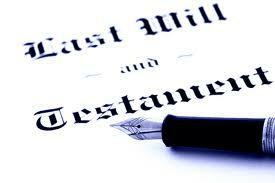 You don’t want to pass without having a will. In addition to the will, we can provide other documents that will ensure your interests are protected when you become sick. A Maryland Advanced Healthcare Directive will detail how you want doctors to handle your medical treatment in the event you become injured and you cannot make your own decisions. A Maryland Advanced Healthcare Directive is a document that we suggest all clients have in the event they enter a state of Terminal Illness, Persistent Vegetative State, or End-Stage Condition. In addition to directing what actions your doctors should take, the directive will name an agent that will make decisions on your behalf. You can name one agent or you can name a group of people that you believe will make the best decisions for you. If you do not have a Will, please call the office immediately at 504-358-2273 to schedule an appointment and have these documents drafted.